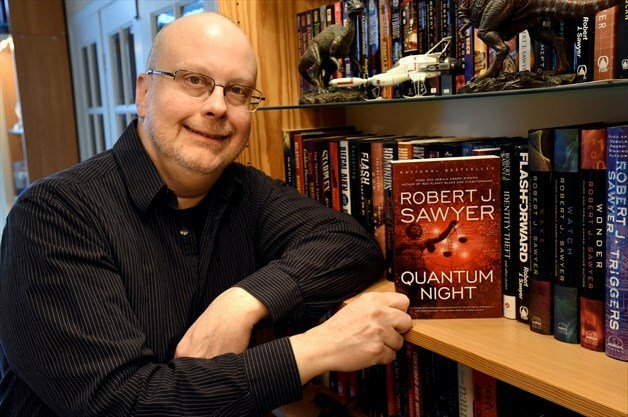 By Carl Slaughter: Robert J. Sawyer talks science premises, scientific method, philosophy of human existence, and the themes and messages in his stories. 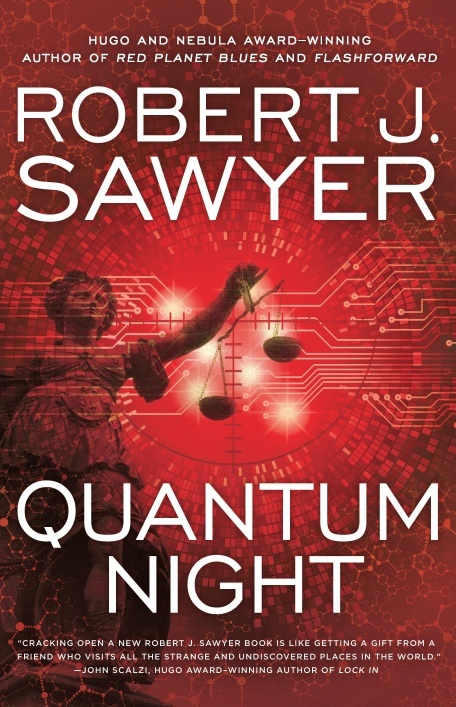 CARL SLAUGHTER: You said of your latest novel, Quantum Night, that the theme is, “The most pernicious lie humanity has ever told itself is that you can’t change human nature.” You list 50 books you consulted for Quantum Night. Why is this so important? ROBERT J. SAWYER: It’s important to recognize that this canard that you can’t change human nature is the ultimate get-out-of-jail-free card; if you accept it, you can forever be racist, sexist, transphobic, jingoistic, militaristic, religious, and so on, then say, well, it’s always been that way so it always must be that way. And that is pernicious. Even when invoked on a small scale, when we forgive someone for being “tone deaf” rather than recognizing that they’re a dyed-in-the-wool racist or misogynist, or whatever, is to excuse the behavior as being an acceptable, normal gaffe rather than something that we rightly demand should be changed, and can be changed. When I teach science-fiction writing, I tell my students that one of the standard story-generating engines for the genre is to take something we normally only think of as metaphoric and treat it as literal — from H.G. Wells’s making concrete the fantasy of knowing what the future holds, to Robert Charles Wilson’s recent The Affinities, which turns the online notion of “social networking” into a real-life paradigm. And so, in that same vein, Quantum Night is quite literally about changing human nature. If we don’t change — if we don’t find better ways of conflict resolution, if we don’t move from zero-sum thinking to win-win thinking, if we don’t discard and abjure our millennia-old prejudices — then we as a species are headed for disaster. As for the bibliography, it’s proven to be extremely popular. 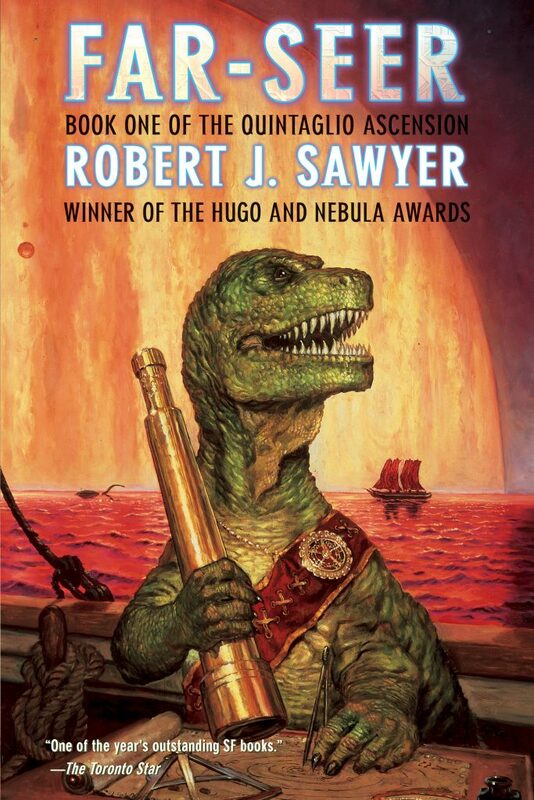 I’ve had short ones at the end of a couple of my previous novels — my Hugo Award-winner Hominids and my John W. Campbell Memorial Award-winner Mindscan — but this is by far the most elaborate one I’ve ever provided. Quantum Night is, among other things, a serious attempt to make sense of human consciousness — I was thrilled when Stuart Hameroff invited me to give a talk about the book in 2013 at the famed Tucson “Science of Consciousness” conference. I allude in the novel’s text to the work of many experts in many areas — psychology, neuroscience, quantum physics, philosophy — but didn’t want to bog down the narrative with excessive exposition. The annotated bibliography is there for those who want to go deeper into the underpinnings of the novel. CS: I was intrigued with the story Far-Seer as well as its cast of characters, both rational and irrational. What lessons does Far-Seer offer society? Does science fiction have a role in the 21st century? Absolutely. If we can help shape the Zeitgeist, help inculcate the belief that rational thought, that discarding superstition, that subjecting all beliefs to the test of the scientific method, is the most reasonable approach to any question, then not only will science fiction have a key role to play in the intellectual development of the new century, but it will also, finally and at last, help humanity shuck off the last vestiges of the supernatural, the irrational, the spurious, the fake, and allow us to embrace, to quote poet Archibald Lampman, “the wide awe and wonder of the night” but with our eyes wide open and our minds fully engaged. Then, finally, some 40,000 years after consciousness first flickered into being on this world, we will at last truly deserve that name we bestowed upon ourselves: Homo sapiens — Man of Wisdom. CS: Are there any parallels between Far-Seer and the Trump era? RJS: That’s an interesting question. Far-Seer came out in 1992, and its sequels Fossil Hunter and Foreigner came out in 1993 and 1994. It’s been observed that there were three great blows to the human ego. First, the Copernican/Galilean revolution — ironically named, if you think about it — that says we aren’t at the center of the universe; we revolve around the sun. Second, the Darwinian revolution, which punctuated thousands of years of our equilibrium, so to speak, by showing that we weren’t divinely created in God’s image, but rather were the results of mindless evolution; and the Freudian insight, which demonstrated that we don’t even really have conscious volition but rather are driven by unconscious forces and the impacts of our early experiences. But, you know, all of those were academic victories for us. It might be irritating to try to argue with a young-Earth creationist, but what he or she believes — and, for that matter, what we believe — doesn’t matter. It doesn’t affect how either of us do our jobs, treat our families, or, indeed, our ultimate fate. But for that trilogy — which I’ve just reissued as ebooks and is collectively called the Quintaglio Ascension — I wanted to tell parallel stories of the three great ego blows on an alien world, but have it be desperately important that the aliens learn these truths. They face an existential threat — doomsday — unless they come to grips with, in turn, the facts of cosmology, evolution, and their own psychology. When I wrote the books, we weren’t really conscious of the existential threat our species is facing, but now, in the current era — and this existed before Trump, but has gotten substantially worse since he was elected — acknowledging radical climate change is crucial; the science deniers, if they continue to have political clout, will result in doomsday for us, too. So, yeah, to answer your question: this trilogy is 100% relevant right now, as its core message — accepting reality; embracing science; thinking rationally not emotionally — is the only thing that will save this planet. 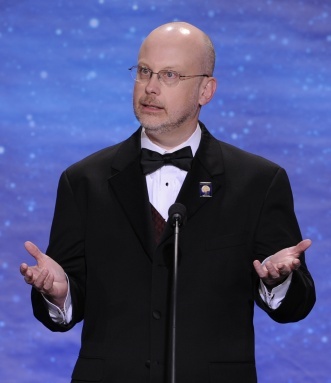 Robert J. Sawyer in 2009. CS: Here’s a report about how Canadian scientists fought the good fight and won. Being a Canadian science fiction writer, can you tell us if this report is accurate and if it offers hope to the American science community and its supporters? So, how did we get out of the anti-science mess that was the horrific Harper regime? We voted him out of office. Trump has already started his bid for re-election; let’s hope you have palatable alternatives — on the left and the right — in your next election. CS: How do the cognitive sciences define a mind? How do you prove a mind exists? If a mind is an object, what is its location, appearance, and molecular structure? RJS: The only mind you can prove exists is your own, as Descartes so handily showed: cogito ergo sum; I think therefore I am. As to whether others have minds or just appear to do so, that’s the whole notion behind Australian philosopher David Chalmers’s “philosopher’s zombie” thought experiment, which I expand upon at length in Quantum Night. Dave, who introduced me when I gave a keynote address at the Toward a Science of Consciousness Conference in Tucson in 2010 — the first of two times I’ve spoken there — reviewed my novel in manuscript for me. The mind is an emergent phenomenon of the brain, not an object. You can no more point to its location, describe its appearance, and define its molecular structure than you can do that for any of the things mind produces, such as patriotism, which is love of the things a nation stands for. It would be as wrong to point to the borders of Canada or the United States and say “patriotism is these neurotransmitter molecules or synaptic webs in relation to all atoms circumscribed by this border.” Mind is emergent; patriotism is a feeling created by mind in response to a concept — a nation’s principles — that only exists within minds. CS: OK, now what’s the connection between consciousness and mind? RJS: Consciousness, as I mostly use the term, refers to self-awareness and self-reflection. HAL 9000 claimed to be conscious; maybe he was, maybe he wasn’t. But in both science fiction and computer science we definitely used to conflate the notions of “artificial intelligence” and “artificial consciousness” into one thing. That’s wrong. We’ve got some great AIs now — Deep Blue and Watson, or even Siri and Cortana — but none of them have any consciousness. They may look like they pass the Turing test in some narrow ways, but they’re only Turing machines, and that’s a key distinction: a Turing machine is an idealized, bare-bones computer that can only perform three basic operations, but can simulate any algorithm, no matter how complex; everything Deep Blue, Watson, Siri, or Cortana does can be reproduced on a Turing machine; they just do it very fast. But as mathematical physicist Sir Roger Penrose, who wrote the 1989 book The Emperor’s New Mind — and who I got to spend time with last year in Tenerife — would argue, self-reflection can’t be simulated on a Turing machine. In other words, we have fast calculators now; we don’t having self-aware devices. To put it in old sciffy jargon, we’ve got electronic brains, sure, but not a single electronic mind. Not all brains are conscious, but any entity that passes the cogito — that can say only to itself and understand what it has said — that “I think therefore I am” is conscious. The conceit in Quantum Night is that four-sevenths of the human race can’t pass the cogito and therefore are not conscious. The lights are on, but nobody’s home. CS: How exactly can a consciousness theoretically be transferred or downloaded? RJS: My friend Andrew Porter used to publish the wonderful Science Fiction Chronicle, and many years ago he won a charity auction to be Tuckerized in one of my novels (where I described him affectionately thus: “Andrew Porter was a tall bear of a man, sixty or so, slightly stooped from dealing with a world populated by shorter people. He had squinty eyes, a beard, and hair combed straight back from a high forehead. His kindly face was home to eyebrows that seemed constantly in motion, as if they were working out, in training for the body-hair Olympics.€). CS: Have you read much literature about the subcognitive – dreams, premonitions, discernment, instinct? People often claim to know things, even though they don’t know how they know, even though they have no scientific proof, and are often vindicated by experience. How do you explain this aspect of human existence? RJS: I don’t explain it; I reject it. People claiming things is not evidence, and the plural of anecdote is not data. None of that has been replicated under controlled conditions. I’m a rationalist, an empiricist, and a skeptic — in other words, a science-fiction fan. CS: What’s on the horizon for Robert J. Sawyer? RJS: My longtime friend (and fellow judge for the Cordwainer Smith Rediscovery Award) Barry Malzberg has just retired from doing the science-fiction column for the bimonthly Galaxy’s Edge magazine and editor Mike Resnick has tapped me to take over. My first column will appear in the July-August 2017 edition. Beyond that, I have a development deal with a major Canadian broadcaster for an original science-fiction TV series, and am having a blast working on that. 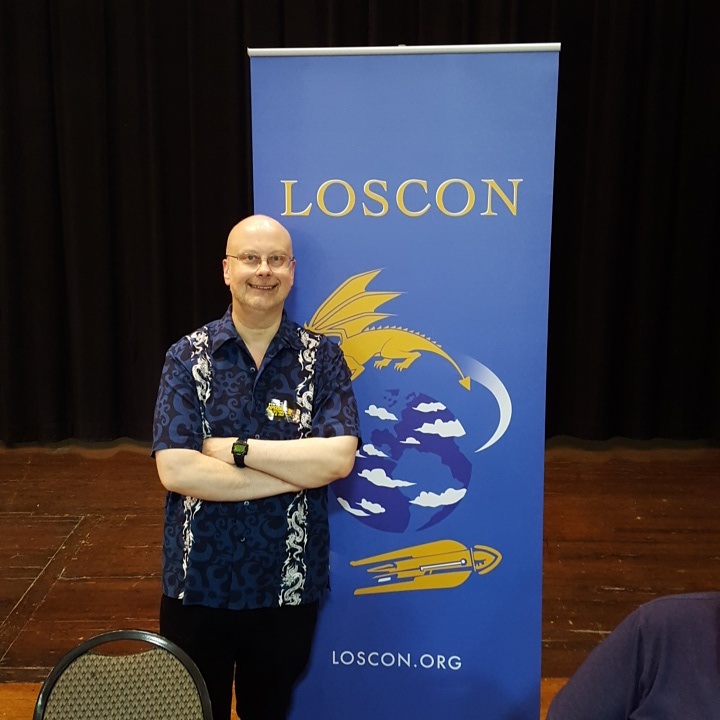 This entry was posted in Sercon and tagged Carl Slaughter, Robert J. Sawyer by Mike Glyer. Bookmark the permalink. I, and I’m sure a whole lot of other people, twitched when Penrose was mentioned. You can argue that self-reflection cannot be simulated on a Turing machine, but it is very much still an argument and not proven. Some of Penrose’s argument seems very much attempting to sneak mind-body dualism in by the back door, while insisting that it isn’t mind-body dualism.